Yes, it's that time of the month again! I held out against the sickness for as long as I could, but, yesterday, I just had to go back to the pawn shop in search of more horror DVDs. As you can see, the two "Ghost House Underground" titles were still there (no big surprise) so I decided to put them out of their misery and bring them home with me. Since I'm still getting hundreds of hits every day on my Eurovision Song Contest posts, I thought it would be amusing to finally have a copy of the Lordi movie. 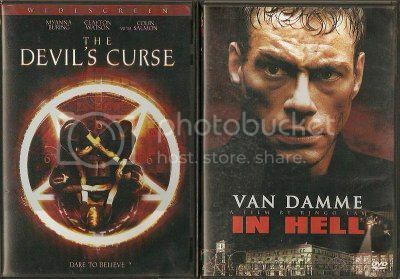 Once I'd found "The Devil's Curse" (or "Credo" as most Brits know it), I had to hunt for something else to complete the "4 for $10" deal but all I could come up with was a Jean-Claude Van Damme movie. Who am I kidding? I love JCVD movies and I know this is one of his better ones. But that really was it. After those DVDs, there was nothing left whatsoever in the pawn shop which I wanted. I would even go so far as to say that I would need to have a lobotomy before I'd ever buy any of the dozens of Disney movies, crappy American comedies, or anything starring puppies. To be fair, the DVD section has always been a bit of an afterthought in my local pawn shop. It's not as if they are worth as much as gold, silver or Playstation games and I know for a fact that the owner only pays 50c each for them. So with much sadness... and then renewed joy... I went to the BIG pawn shop on the other side of town. Oh yes, an adventure! With all their DVDs being in alphabetical order (floor to ceiling around the whole store), it was a lot easier to go through what they had. Of course, I had most of the titles already, but when I found that these DVDs were "5 for $10", as much as I wanted to stay selective, I didn't care what I grabbed. Known as "Bay Coven" in the UK, which gives away the plot considerably (like a flaming pentagram on the artwork doesn't! ), I'd been looking for this for a while. It has the actress who played Nancy Drew in it (not that I'd every admit to watching that series). I also grabbed "The Black Cat" because, well, I didn't have that either. Things then started to get a bit silly because I bought two films which I don't like. 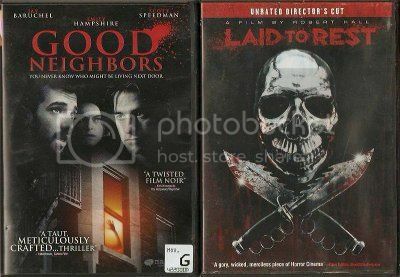 I hate anything by David Cronenberg or Eli Roth but I missed these in the Big Lots $3 DVD madness a couple of years ago. I've never heard of "The Dark Hours" before but the artwork looked interesting. As long as it isn't as crap as "Frailty", I will be happy. 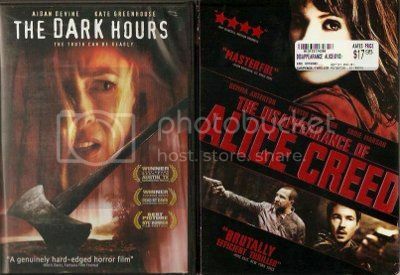 I'd seen "Alice Creed" on Netflix and since this was originally a $17.95 DVD from somewhere, it was a bargain at $2. I was very pleased to find "Good Neighbours" even though it's spelled wrong. It's a Canadian movie so it should be o-u-r-s not o-r-s just as I would spell it. I've seen it already, but you know my thing about cats. "Laid to Rest" was a replacement for my other copy which freezes at the end. And then I saw them! Yes, THEM! 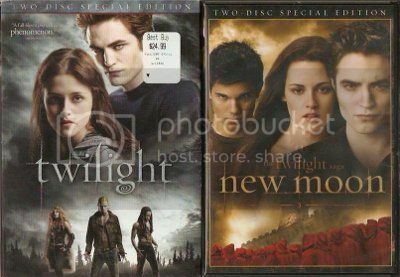 Twilight two-disc editions!!! The "originally $24.99 from Best Buy" editions! I had to have them. 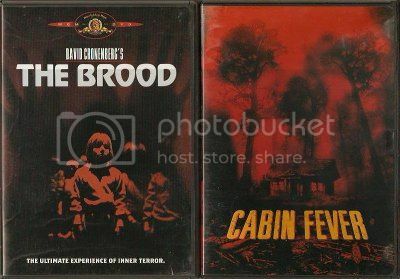 You can't even call yourself a real horror fan if you don't have these in your collection. But wait, there's more! "Eclipse", oh yes! For $2, of course I don't care that it's a "Single Disc Edition". 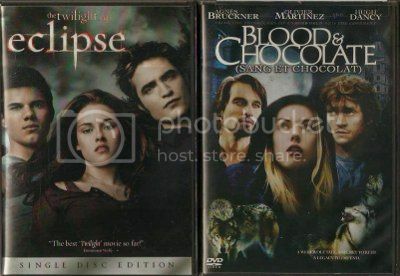 "Blood and Chocolate", well, that's just "Twilight" before "Twilight" existed or something. I don't care what you think, I like these films. Finally, even though they are only $2.99 anyway in Kmart, I didn't have these Echo Bridge packs but I do now! "Bachelor Party in the Bungalow of the Damned" is the movie where Zoe Hunter shows her boobies (unlike in "Witchcraft 13") and "Curtains" in the other set isn't a bad film even though it's dated. I looked for more horror DVDs but most of the weirdly titles ones with lurid covers were single disc editions of public domain movies. There were also a lot of handycam "no budget and no entertainment value" movies which can rot in their cases for all I care. After two hours, and not very much money spent at all, I got some pretty nice bargains. I doubt that you are jealous. I know my taste probably isn't the same as yours. I'd like to think it is but, unfortunately, the reality is far different. There were definitely a lot of movies there which some of you would have wet yourselves over but I couldn't care less about. I saw a "T2" steelbook for $2 but I hate that film and find Edward Furlong's interactions with Arnold Schwarzenegger cringeworthy. There were loads of Criterions too which, again, I have no interest in nor, apparently, does the pawn shop owner. I've noticed that both pawn shops have increased their blu-ray sections considerably, have phased out their VHS entirely, and aren't paying "top dollar" for DVDs anymore. 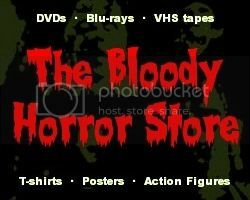 It's a shame in some ways that DVDs seem to be almost worthless now but they are still my main source of horror pleasure and I am reaping the benefits as other people with more money than sense upgrade.